Celebrating 25 Years of the Women's Center! The Women’s Center celebrated because we turned 25 years old! That’s right – the Women’s Center is 25 years old! We celebrated our 25th Anniversary Celebration Tuesday March 21, 2017 in Bigelow Hall, Miller Information Technology Center (MITC). 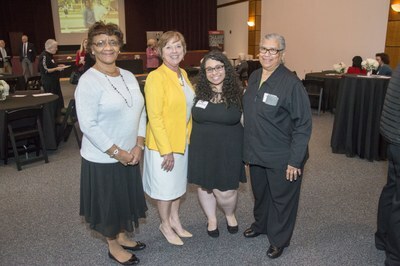 We took a trip down memory lane with special remarks from former Women's Center staff and friends of the Women's Center including hors d'oeuvres, jazz music and more! We also had a birthday celebration Thursday August 24th, 2017 in UofL's Red Barn 11am-1pm as we celebrated 25 years on campus with vendors, music & refreshments! *Women’s Equality Day 2017 was also celebrated. Check out the photos of our celebrations and the past 25 years! To learn more about the Women’s Center read our Annual Reports.